MONTICELLO, AR (October 26, 2018) -– Yesterday, SeaArk Boats hosted thirty students from Southeast Arkansas Community Based Education Center (SEABEC) to educate students on manufacturing jobs and a tour of the facility. SEACBEC partners with local schools to provide education opportunities for students and adults in several programs of study, including welding. Students were able to test out their welding skills and understand the type of welding required at SeaArk. Welsco provided a virtual welding machine called the Lincoln Vrtex Mobile. 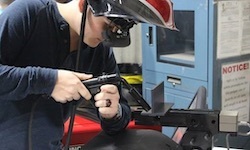 The simulator allows users to practice welding without the waste of metal and supplies. It is a great training tool for schools and vocational programs such as SEACBEC. If you are interested in finding out more about the Lincoln Vrtex Mobile or having it at your career or manufacturing day, please call Blake James with Welsco at 501-920-4981. About Welsco, Inc.: Celebrating 77 years in business, Welder’s Supply Company, has been serving Arkansas and Oklahoma businesses with top quality support and supplies for any welding need. Still family owned, third generation member Angela Harrison now owns and operates the largest independent welding supply and industrial gas distributor in the world.